My name is Adaline Jacobs. I am moving to Philadelphia to start over and get away from everyone that only sees me as the girl who's father disappeared. When Nolan appears, everything I know about myself changes. Should I run away? Like I did from my hometown or embrace the opportunity to grow and allow people in. My new life starts to make me question the only person I have ever trusted. Will I be able to trust and open up to the new men I have in it? Can I discover what it means to be Aether? And manipulate the element that's always been inside me? This is not what I had planned when I packed my bags a week ago. This is an introduction to the series and Characters. A Quick Read. 25,000 Words. Adaline Jacobs is trying to escape from a town that knows her as the girl whose father disappeared. When she turns 18 things change for Adaline. Not just that she has 20/20 vision after years of glasses. It's in the fact that she does not have anything tying her to this town, except her step mom and she does not count. So she leaves and lands in Philadelphia. There while roaming the streets she comes across a building that captures her attention. There she meets Nolan and Kevin. She experiences a connection with both of them. When they inform her that she is their nucleus, and she is part of a quint. That she is rare and is very powerful. While trying to learn her powers and what it means, it is revealed she is in danger. Good thing she has Nolan and Kevin to look after her. 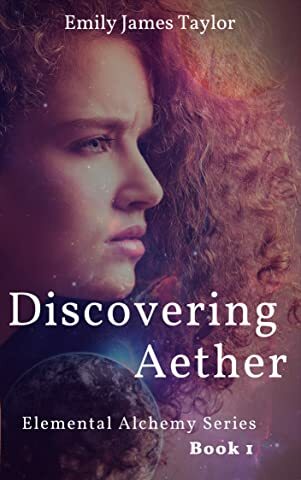 Emily James Taylor is a new author and Discovering Aether is her first novel. There are some mistakes, the story line is a quick read, and flows very quickly. A lot of information is given in a short amount of time, but that is the trick with serials. I found Discovering Aether a very interesting start to a intriguing series. I think that the idea and the characters are engaging and I really enjoyed the introduction into what a Aether is and all about Adaline and her two men Nolan and Kevin. I can't wait to see who else gets to join her harem, I believe there will be two more. I went into this read knowing this is her first book, and the author herself let me know that some mistakes were found and she is working on fixing them. I once again kept in mind that this is her first book. I think she has a really good story and characters and I really want to see how book two turns out.